Q2: Living Music. Living Composers. But upon closer inspection, the movements reveal distinctive qualities, following on from one another like the way shadows change as the sun crosses the sky, or tides move in and out from the shore. 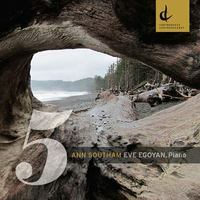 Pianist Eve Egoyan masterfully manages to retain the overall consistency of style across the five pieces composed from a 12-tone row while drawing our attention to the subtle changes that disrupt the ever-steady pulse of the left hand drone and right hand chords. San Francisco-based arts journalist and broadcaster Chloe Veltman has contributed articles and reviews to The New York Times, BBC Classical Music Magazine, Gramophone, the Los Angeles Times, The Economist, The Wall Street Journal and many other media outlets. She is the host and executive producer of VoiceBox, a weekly, syndicated public radio and podcast series about the human voice, and blogs at ArtsJournal.com. Follow Chloe on Twitter at @chloeveltman.